CHICAGO--(BUSINESS WIRE)--dunnhumby, the global leader in customer data science, today released the second annual dunnhumby Retailer Preference Index (RPI), a comprehensive, nationwide study that examines the $700 billion U.S. Grocery market. The RPI study surveyed 7,000 U.S. households to determine which of the top 56 largest grocery retailers have the strongest combination of financial performance and consumer emotional sentiment. Trader Joe’s was again the top-rated grocery retailer. 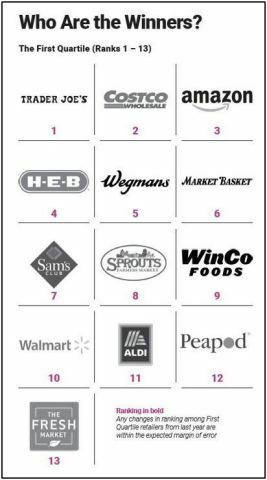 The grocery retailers with the highest overall consumer preference index scores are: 1) Trader Joe’s, 2) Costco Wholesale, 3) Amazon, 4) H-E-B, 5) Wegmans Food Markets, 6) Market Basket, 7) Sam’s Club, 8) Sprouts Farmers Markets, 9) WinCo Foods, 10) Walmart, 11) Aldi, 12) Peapod, 13) The Fresh Market. Two needs rise above all others for most food retailers and have the greatest weight in determining RPI ranking, forming the core of value perception: Price and Quality. Retailers that rank in the first quartile overall excel in value perception and, as a result, have sales growth that is 2x greater than retailers in the second quartile and 9x greater than retailers in the bottom two quartiles. The other customer needs, like digital, speed, convenience or discounts/rewards, while still important, have a weaker association with retailer preference. Trader Joe’s again named the top U.S. grocery retailer in the second annual dunnhumby Retailer Preference Index, based on survey of 7,000 households.